Welcome to American Cyber Logistics. Here you will find your premier third party logistics partner that will provide advanced business solutions. Let us solve your warehousing and transportation needs while you focus on growing your business. Whether it is long term, short term, simple or complex, we have your solution. Innovative Solutions From Your Logistic Specialists! 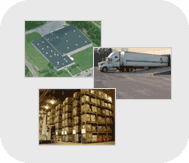 We offer logistics services and public warehouse space in our modern, company-owned, 128,200 - square - foot facility. Our warehouse is 100% sprinklered and has nine truck doors and one drive-in door. In addition to storage we have available thirty foot clear narrow aisle racking with turret trucks to operate. Our facility is fully climate controlled. We can handle any aspect of your business. From pick and pack to order fulfillment, full truckloads to small deliveries and all types of container services, we do not shy away from any task. We will partner with you to grow your company and become more efficient. 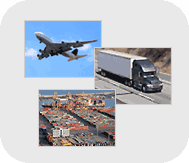 We also provide trucking and delivery service if you are in need of expeditious services. 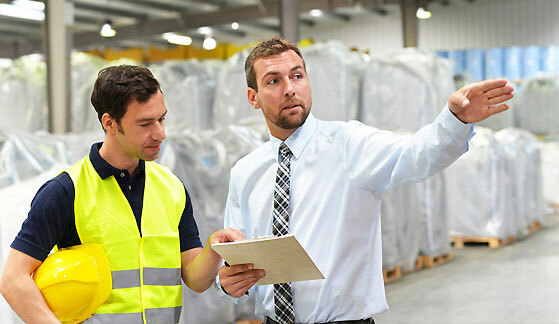 Our interactive real time inventory management system gives you all the tools to track your inventory, keep track of shipments and gives you the ability to create spreadsheet and PDF files for your business reports. 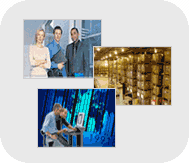 We provide fully computerized bar-coded inventory processing from inbound to outbound moment. Convenient 24/7 online access to customer's information inventory stored in our warehouse. Daily automated reports available for download from our website. Specialized loading and unloading equipment. Self driving, high ceiling equipment. All loading docks with load levelers. Ample room for full size tractor trailers to maneuver. Production area over 12,000 square feet, modern lighting with sealed floors. Ample parking for over 150 cars. Our warehouse is located in very convenient spot on the map at the Pepperdam Industrial Park off Ashley Phosphate Road in North Charleston, SC. Just several miles from the docks of Charleston, a few minutes from The Charleston International Airport and almost next to Interstate Highway I-26. With our staff averaging over 20 years of experience, American Cyber Logistics can deliver to you outstanding service and on time deliveries. Our knowledge of the warehousing industry combined with our extensive fulfillment network makes American Cyber Logistics a top tier distribution and fulfillment center. The team at American Cyber Logistics will put your mind at ease and let you concentrate on what you do best while taking care of all your business needs. We look forward to a bright future together. Our clients are leaders in their industries. We partner with our clients to grow their business while maintaining outstanding service. From Fortune 500 to local business, our client’s needs are exceeded in every way possible. From receiving to inventory control to delivering products to our plant, American Cyber Logistics provides unmatched service. On time every time and always our first choice. What a great group of people. They changed our whole distribution system and now we are never late and our return rate is almost zero. Glad we choose American Cyber Logistics. American Cyber Logistics handled all our automotive needs. A true 3PL providing quality service again and again. Providing 24 hour on call service was crucial to our manufacturing needs and they came through every time. Their order fulfillment is state of the art. They offer same day shipping, 24 hour online access to our inventory and overall superior handling. That is why we continue to use American Cyber Logistics as our distribution warehouse. These guys have been amazing for 10 years now. They handle all our logistics, incoming shipments and delivery to our operation. They are an integral part of our manufacturing process. We recommend them without hesitation. Brian and his staff provide outstanding service along with add on services such as repacking, sorting and testing. They handle our inventory from half way across the country, saving us time and money.